There are several diesels based on the line, this page includes the ex BR ones including DMU's, there are also some former industrial shunters that I haven't go details/photos of. 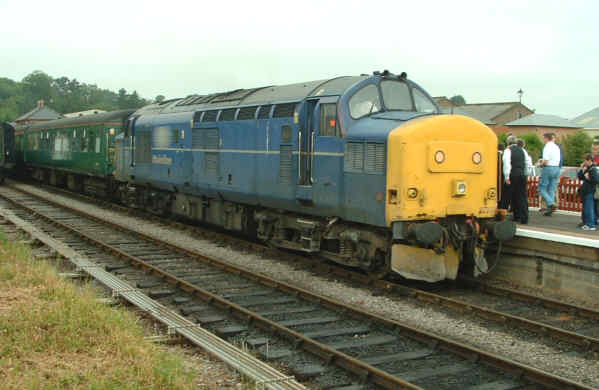 There is also details of visiting diesels during the year. 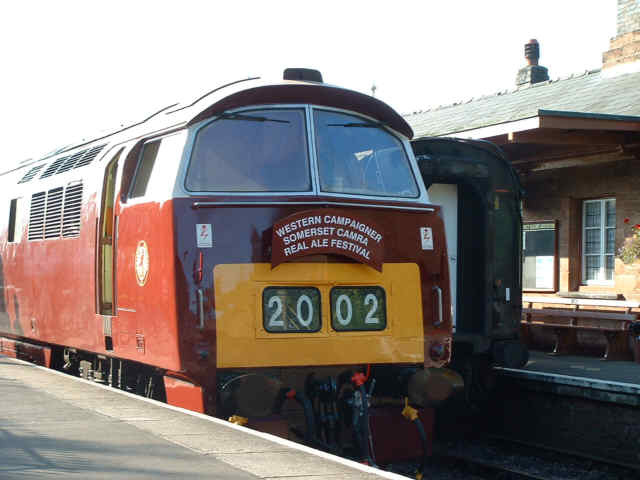 A Swindon designed and built loco, the DEPG's D1010 Western Campaigner is a member of the once 74 strong Western Class of C-C diesel hydraulics. Engines: Two Maybach MD655 V type of 1,350 bhp at 1,500 rpm. Transmission: Hydraulic, two Voith-North British L630rV hydraulic transmissions, each containing 3 torque converters. Driving wheel diameter: 3' 7"
D2133 (left), seen shunting 5224 and 4160 at Minehead and 03119/D2119 are both ex BR Class 03 0-6-0 diesel mechanical shunters. 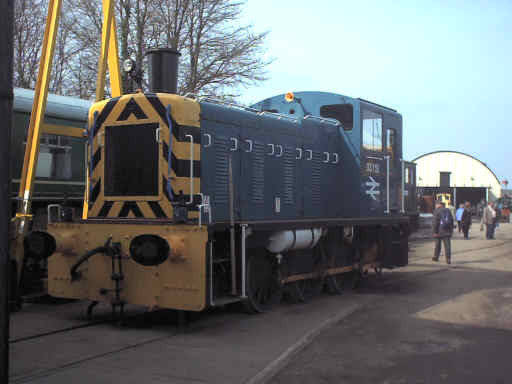 D2133 was at one time Cellophane's shunter at their Bridgwater factory, it was donated when Thatcher's policies led to the chemical traffic going on to the roads. Engine: Gardner 8L3 of 204 bhp at 1,200 rpm. Transmission: Mechanical, Vulcan-Sinclair type 23 fluid coupling, Wilson-Drewry CA 5 type 5 speed epicyclic gear box. 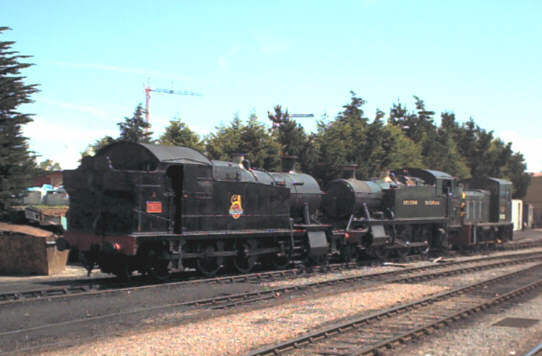 D2205 (11106) (DEPG) and D2271 (WSR plc) are ex BR Class 04 0-6-0's, very similar to the Class 03 they were built by Drewry. Their technical details are the same except they weigh 29 tons 15 cwt and have 3' 6" diameter driving wheels. 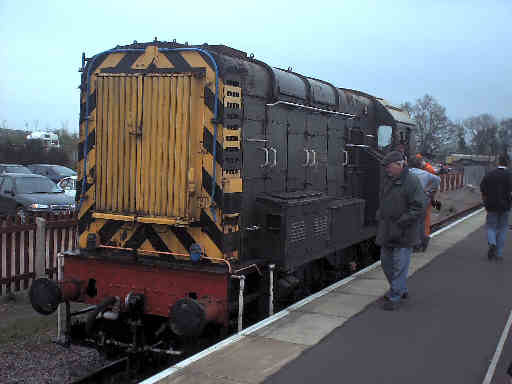 This is an example of a BR built Class 08 0-6-0 shunter, often called Gronks. 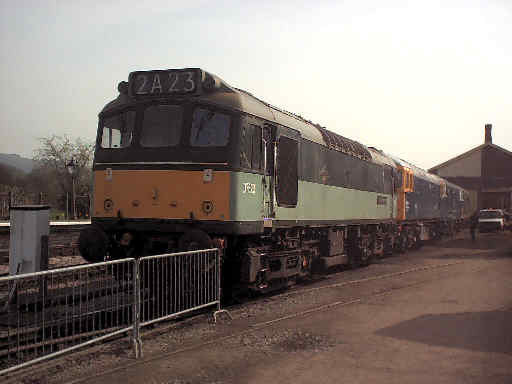 There are many still in service on the "big railway" but D3462 is a very useful part of the WSR fleet. Engine: English electric 6 cyl 6KT of 350 bhp at 630 rpm. Transmission: Electric, 2 English Electric nose suspended traction motors. Driving wheel diameter: 4' 6"
Engine: Sulzer 8 cyl 8LDA28 pressure charged of 1,550 bhp at 750 rpm. 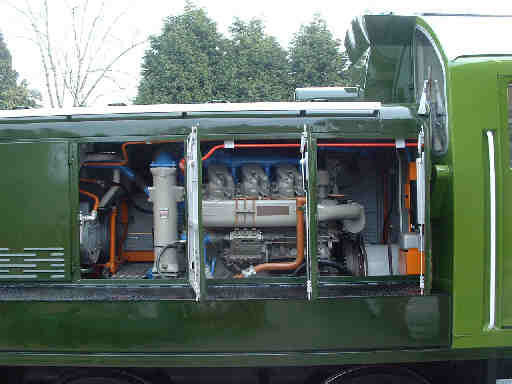 Transmission: Electric, 4 Crompton Parkinson 305 hp axle hung, nose suspended traction motors. 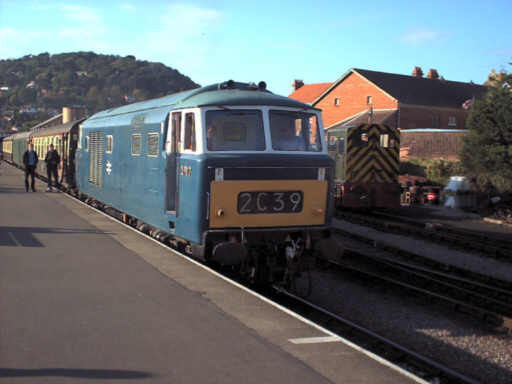 The Diesel and Electric Preservation Group have two Class 35 "Hymeks" on the WSR. 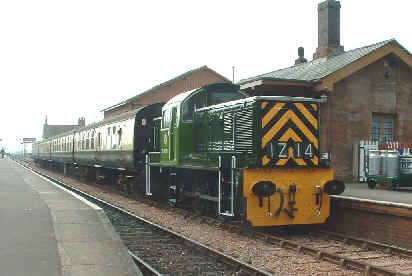 D7017, seen here, is restored and in operation whereas D7018 is undergoing major repairs at Williton. They were built by Beyer Peacock Hymek for the Western Region, they are type 3 B-B's. Engine: Bristol-Siddeley/Maybach MD870 of 1,700 bhp. Driving wheel diameter: 3' 9"
D7523, another member of the DEPG's fleet, is a BR Derby built Class 25 Type 2 Bo-Bo diesel electric. Engine: Sulzer 6 cyl 6LDA28-B pressure charged of 1,250 bhp at 750 rpm. Transmission: Electric, 4 AEI253 AY axle hung, nose suspended traction motors. D9526 has recently been completely overhauled and is seen here on its return to traffic special working, 12 April 03. The Class 14 type 1 0-6-0s were built by BR at Swindon in 1964/5 by which time the traffic they were intended for had gone so they spent many years with industrial users. Engine: Paxman 6YJX Ventura of 650 bhp at 1,500 rpm. 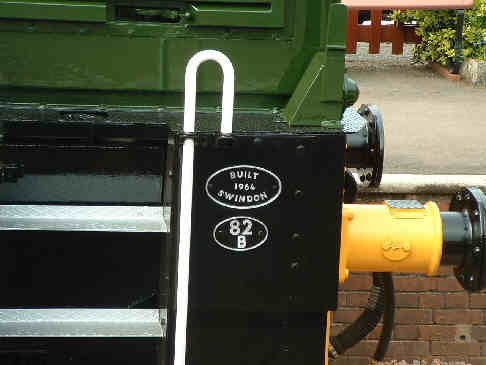 The railway operates two D.M.U. sets at present, along with some trailers used as hauled stock. In addition there are some vehicles stored out of use. 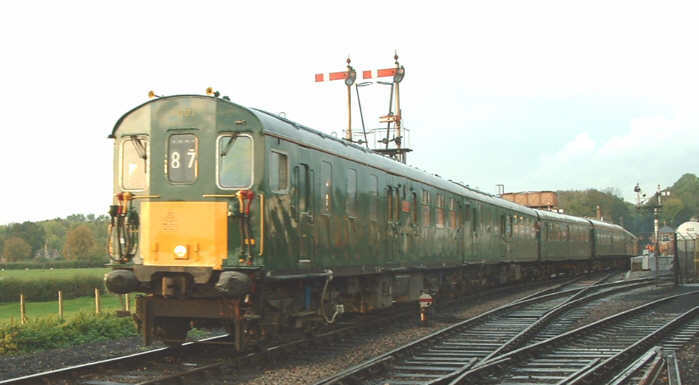 The Class 117 unit (in green livery) was restored by a Territorial Army unit . In service: 51859 and 51880 with 51887 listed as serviceable spare. Out of service: 51663, 51852. These are of two types, both with 2 BUT (Leyland) 6 cyl horizontal of 150 bhp with mechanical transmission. Motor Brake Second: 51352, 65 seats as built. Motor second: 51376, 91 seats as built. Both will have lost some seats when the gangways were fitted by BR. There is only 1 115 Trailer Lavatory Composite in the fleet, 59678, though the first class isn't used as such. It also has a buffet in place of one of the lavatories and is currently in use with the 115 power cars. 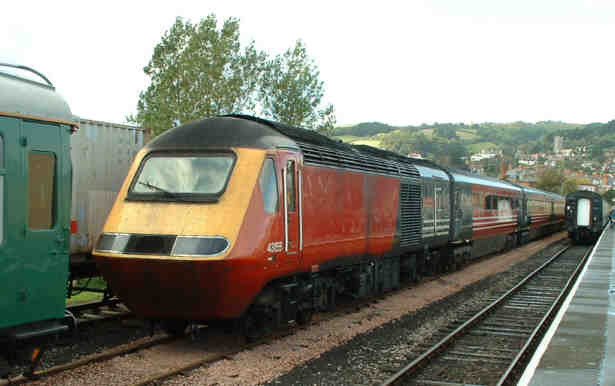 It is in crimson and cream livery. 59493, 59505, 59510, 59515. In addition 59514 is out of service with fire damage. Back in the late 70's the WSR plc bought two 2 car Park Royal DMUs, both were used for some years before being withdrawn, one was sold off the railway and has since been scrapped, the other has been acquired by the Diesel and Electric Preservation Group. The two cars are Driving Motor Brake Second W50413, 52 seats, two BUT (AEC) 6 cyl engines of 150 bhp and Driving Trailer Composite W56169 which has 16 first and 48 second seats. Both vehicles are in the process of a major overhaul at Williton. 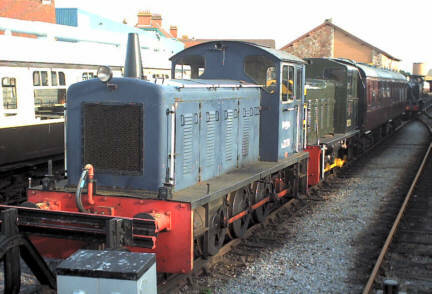 The WSR plc has two Andrew Barclay 0-4-0 diesel hydraulic shunters based at the Permanent Way depot at Dunster, there is a Ruston Hornsby 0-4-0 diesel mechanical shunter at the S&DRT's base at Washford while the DEPG have a master and slave pair of Bagnall 0-4-0 diesel electric ones at Williton where they also have a Sentinel 0-4-0 diesel hydraulic from the Manchester Ship canal. 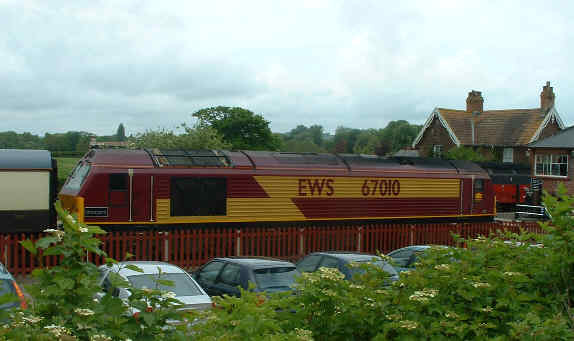 Another EWS 67, 67010, visited the line for the Cross Country Weekend and is seen here at Bishops Lydeard. EWS also sent 47732 along for the Cross Country Weekend, it is seen here at Bishops Lydeard top and tailing with another visitor, 46035. 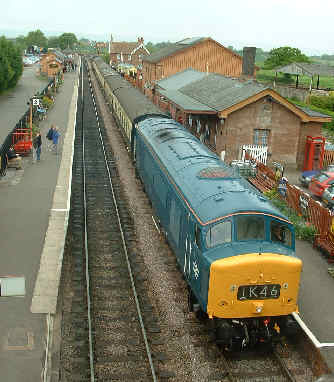 Preserved Class 46 "Peak" 46035 seen at the other end of the train seen above at Bishops Lydeard. Fragonset's 47709 visited on 17 May with a through special from Leeds which had a record 668 passengers on board. 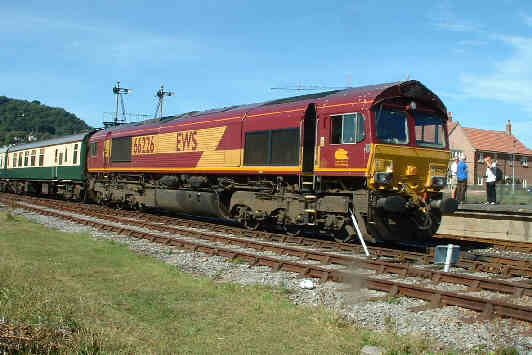 EWS sent 66226 with a through special from Paddington on 13 September. 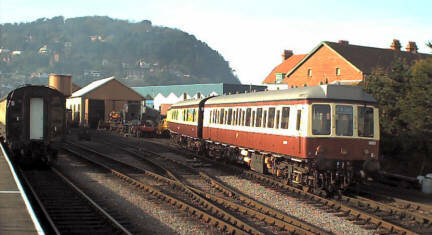 It is seen here in the sidings at Minehead with its stock, RCS's Pride of the Nation dining set. 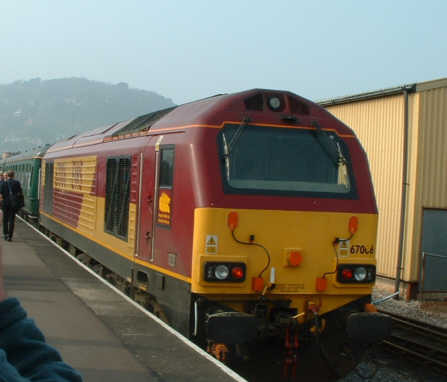 In 2004 the West Somerset Railway held a Diesel Gala for the first time for some years, the visiting locos can be seen on that page. 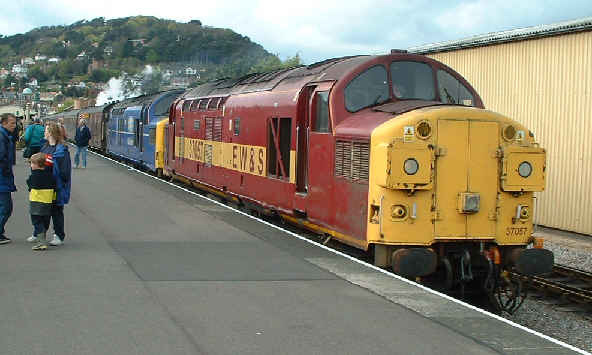 On 17 April 2004 EWS's 37047 and 37057 visited with a special from Milton Keynes. 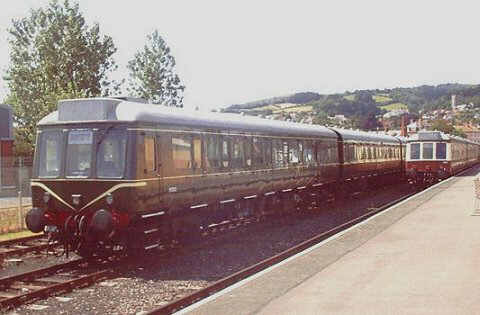 On 26 June 37203 took a through special back as far as Westbury while the steam loco went light to Westbury to turn. 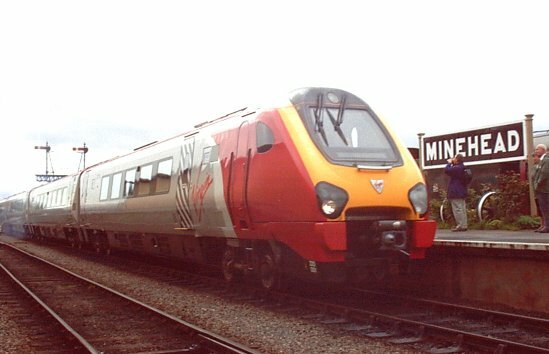 In late September 2004 an HST belonging to First Group arrived at Minehead for storage, it is an ex Virgin set that had been used by MML on Operation Rio and was joined by several other HST vehicles, all of which have now left. 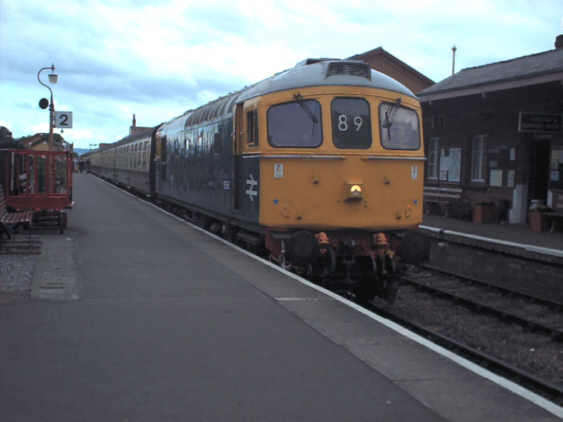 In October '04 a Hastings "Thumper" unit visited on a special from Hastings to Bishops Lydeard. 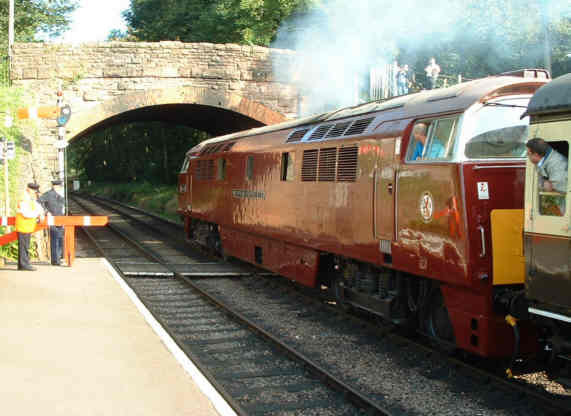 The visiting locos for the the Spring Diesel Gala 05 can be seen on that page. Photos not otherwise credited are ©2001- 2003 S G J Huddy. Other photos are included with permission of the copyright holders.